Snorkeling has become a very popular vacation activity. Tropical waters lead way to beautiful fish and colorful coral. In order to get the most out of this experience you will need the best snorkel gear to help you see all the beautiful underwater world has to offer. This includes flippers to keep you swimming easily, a snorkel that will allow you to breathe with ease and a high quality mask that will give you unobstructed views of the water. We know you will be hooked after your first snorkeling experience, that is why we know it is better to buy your gear than to rent every time. To help you pick what is right for you, we have compiled a list of the best snorkeling gear on the market. This packaged deal is great for outfitting the whole family. With a variety of different sizes and colors you are sure to find something for the whole family. Included you will find a mask, a snorkel, fins and a mesh carrying bag. With everything at your fingertips you are all set to have an unforgettable vacation. This makes these a perfect beginners snorkel gear set. The snorkel mask that comes in this package is made using high quality materials. The silicone two window mask has a low profile design sitting close to your face. The skirt edge expertly conforms to the shape of your face giving you watertight performance. With an easy to adjust buckle you will be able to get the perfect fit from this mask. The included snorkel shows the quality of this buy being a 100% dry snorkel. That means that in addition to the valve that will close when diving preventing water from entering the tube, it is also splash resistant. This is great for those who are swimming in choppy waters or with kids around which eliminates any chance of surprise water entering the snorkel. This is a great safety feature, especially for those with families. A large purge valve makes cleaning this snorkel easy. Coming in three different sizes and a plethora of color choices this snorkel set is ideal for both young and older swimmers. 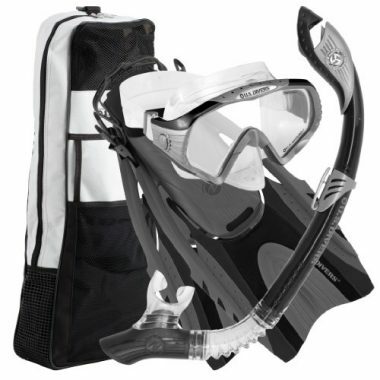 Fitting childrens size 10 to adults size 13 this snorkel set is ideal for families. Included you will get a snorkel, a mask, a carrying bag and fins. This snorkel mask features a single lens design giving you an unobstructed clear view of the beautiful underwater world. A low profile design brings the mask as close to your face as possible giving you an even clearer view. A high quality silicone skirt comfortably hugs your face and protects against water entering your mask. A tempered glass lens lasts longer than regular as it is shatterproof and built to last. The high quality dry snorkel included in this package will ensure you have a safe snorkeling trip. Easily securing to your scuba mask this snorkel features a flexible tube that is great for traveling. This also allows you to maneuver your snorkel into a position that is comfortable for you. The fins that come with this set are powerful. Known as a trek fin, this short fin is agile enough to be used as a bodyboarding fin. Expertly cutting through the water with minimal drag this fin allows you to snorkel for longer without leg cramps. The mesh bag with a top draw string is large enough to easily fit all of your snorkeling gear. This is convenient for travelers as you will easily be able to transport your gear without weighing down your bag. This bag is designed to ventilate your gear and make it fast drying. What makes this the best snorkeling gear package? 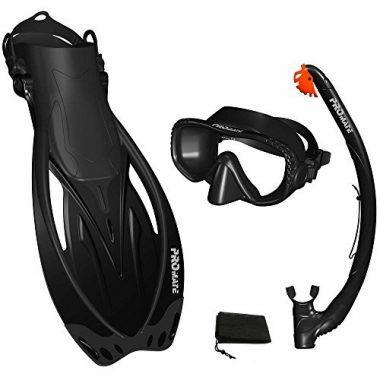 Snorkeling equipment reviews are raving about the quality you get with this snorkel package. 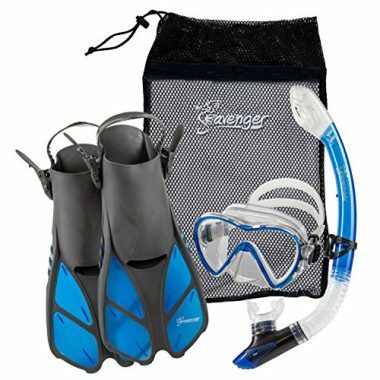 A wide range of colors and sizes makes this snorkel, mask and fin set the perfect choice for your vacation. A form fitting splash skirt and splash top perfectly forms to your face for a comfortable and watertight fit. A clear two window design gives you a clear view of the underwater world. A separate nose section allows you to easily equalize your ear pressure during your swim. The flexible snorkel that comes with this package has a splash resistant top. This is ideal for adults traveling in calm flat waters where you will not encounter many waves. The flexible design gives you the freedom to adjust the snorkel to a comfortable position for you. These fins have a full foot pocket that allows your feet to comfortably fit inside. This gives you a spacious feel that will fit almost any foot. The proflex design cuts through the water with ease allowing you to go even further. The gear bag easily fits everything in one convenient place. The mesh design allows your gear to air dry without causing an odour. This lightweight bag has a shoulder strap that makes it easy to transport. U.S. 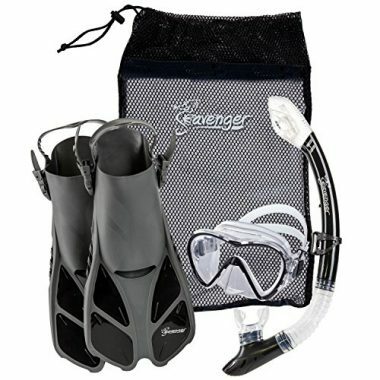 Divers made yet another top rated snorkel set with this one. Everything about this set set shows its high quality. Coming in an array of different colors ranging in size from a men’s size 4 – 13 there is something for everyone. Enjoy the superior materials in this mask, snorkel and fin combo. This face mask is made using hypoallergenic materials to cause less irritation against your skin. The dual window design offers a surprisingly large viewing area making it a great option for your next tropical swim. The face skirt sits incredibly comfortably against your face and allows you to snorkel for longer. As a bonus, this mask has a GoPro mount attached to it so you can share your experience with others. The snorkel that is included has a dry top which means that water will not enter your breathing tube even when diving below the surface. The ergonomic flexible silicone design of the mouthpiece sits comfortably in your mouth and reduces the chances of jaw fatigue. The flexible tube is easily attached to your face mask leaving you nothing to do but explore. The flippers in this pack have deep foot pockets with adjustable straps that sit comfortably against your skin. You can wear these fins with or without snorkel socks as the material is designed to not irritate your skin. These sharp fins allow you to move through the water easier than bare feet as they cut the water propelling your forward. Finally, this set is complete with a travel bag. This heavy duty backpack is great for those with families as it comes with many compartments to carry much more than just your snorkel gear. It’s small size will not get in the way when packing for longer trips. This snorkel combos comes in a number of sizes and colors. 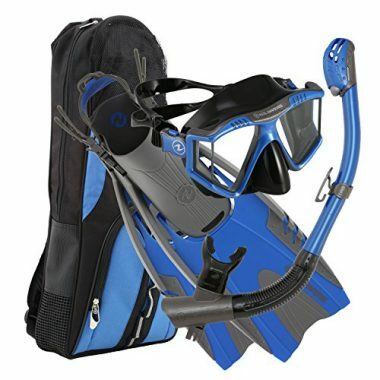 You will get top quality with this buy including a top quality snorkel bag. The snorkel, mask and fins that come with this pack show the quality as well making this the ultimate summer buy. The snorkel mask will last for many years to come. This single window lens allows you to see even more of your surroundings underwater. A tempered glass design guarantees durability making this mask ideal for travel as it is sure to last. The silicone skirt is expertly designed to form fit your face giving you a tight seal that protects against water entry. An adjustable strap makes it an excellent fit for just about any face size. This snorkel features a splash guard that is sure to keep your snorkel dry and safe. Not just that but this snorkel has the much preferred dry top which allows you to dive into the water without fear of water entering your snorkel. A one way purge valve makes cleaning this snorkel easier than ever before. You will no longer have to suffer from jaw fatigue as this snorkel features a comfortable and fully flexible silicone mouthpiece. It is easy to secure this snorkel to your mask for a comfortable swim with the fishes. This snorkel fin set allows you to cut through the water with ease. Their stylish design pushes water back with each kick. The soft flexible fins have an open heeled design with adjustable straps that allow you to get a comfortable and personalized feel. The bag that comes with this snorkel package also comes with a matching shoulder bag that will easily fit all of your gear. This zippered bag is incredibly durable and is great for travel. 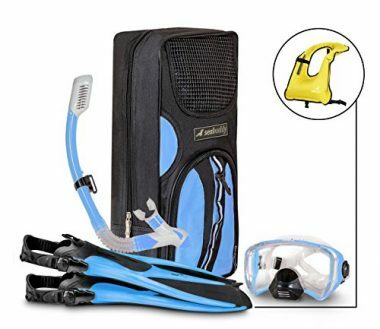 This snorkeling combo pack comes equipped with everything you need to get into the water. 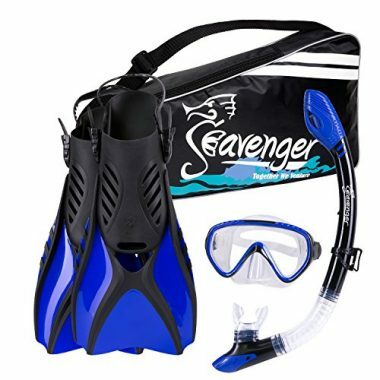 With a snorkel, mask, fins and a drawstring carrying bag you are all set to have an unforgettable vacation. This snorkel mask has a single lens design that helps you to get the most from your experience. You will get a panoramic view of the underwater world. An adjustable buckle firmly fits your face while the skirt molds comfortably to your face shape. A snorkel splash guard helps to ensure that no water will enter your snorkel unexpectedly. This snorkel goes one step further being a 100% dry snorkel. A pre curved flexible mouthpiece sits comfortably in your mouth. A purge valve allows water to be cleared and makes cleaning your snorkel easier than ever. The lightweight fins that come with this snorkel are great for traveling. A soft rubber foot pocket keeps your feet comfortable even on the longest of swims. An open heeled design with an adjustable strap form fits your foot perfectly. A nylon mesh bag rounds this packaged deal out. Perfectly fitting all of your snorkeling gear in one place, this mesh bag is great for easily washing your gear and air drying. Coming in two different sizes and a multitude of colors this snorkel set will help you look like an experienced snorkeler no matter your skill level. 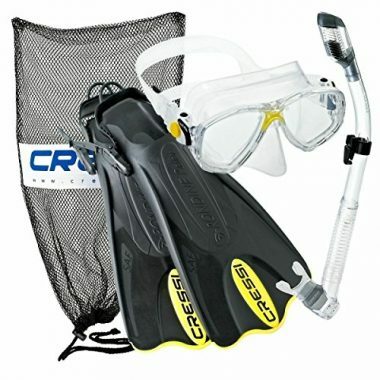 This package comes equipped with a high end mask, snorkel, heavy duty fins, and rounded off with a mesh carrying bag. This mask is sure to keep the water out with its comfortable silicone skirt that molds to your face giving you a watertight design. This low volume mask sits closer to your face giving you a less chunky feel. The snorkel while not completely dry does feature a valve that allows it to be semi-dry. This helps to actively prevent water entry into the snorkel helping you to enjoy your snorkeling with ease. The flexible tube is easy to bend and conform to your face shape. The real prize in this snorkel set is the high quality snorkel fins. These are great for those looking to explore farther or those less strong swimmers. These snorkel fins are said to deliver twice the speed with half the effort allowing you to not suffer from leg and foot cramps during your swim. The open heel design with an adjustable strap sits comfortably against your skin and is adjustable to give you a personalized fit. The low profile mesh drawstring bag that comes with this snorkel set creates no added bulk while being durable enough to carry all your gear together. The large openings allow you to rinse your gear while stored in the bag and provides adequate ventilation to keep your gear smelling fresh. U.S. Divers has made another amazing watersport package. The expert quality is apparent in this snorkel mask, fins and snorkel that this package comes with. The mask in this set has a single window design that allows you an unobstructed view. A completely adjustable head strap fits easily to your body as the silicone skirt forms to your face shape giving you a watertight fit. A tempered glass lens is incredibly durable and will withstand many trips around the world. This snorkels small and comfortable mouthpiece will reduce your chances of jaw fatigue. A flexible tube allows you to easily conform this snorkel to fit as you need. A dry top allows you to take your snorkeling even deeper allowing you to dive below the surface without fear of water entering your tube. The fins that come with this set are incredibly stylish and made using high quality materials. An open heel design allows them to fit a wider range of sizes. The adjustable strap easily conforms to the shape of your foot. The strap sits comfortably allowing you to wear these flippers without socks. Take this snorkel set with you everywhere you go with the high quality carrying bag. This heavy duty pack has many different compartments that will easily fit all of your gear as well as some vacation essentials with you. This package comes equipped with a snorkel, a mask, fins and a travel bag. This set comes in two different sizes and a variety of different colors to help you get a look that is uniquely yours. In addition to a lifetime of customer support, this product offers a one year full warranty.This is the best snorkel set package for traveling. 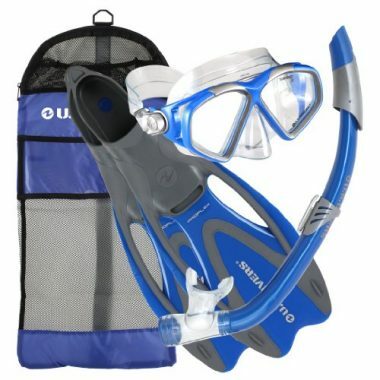 The mask snorkel set that is included with this package has 4 windows for optimal viewing. With crystal clear lenses you will be able to see even more of the life underwater. A concave nosepiece sits comfortably against your skin and is ideal for plugging your nose to combat ear pressure balance. This hypoallergenic face mask is a great option for just about anyone coming in two different sizes to fit you better. Made using tempered glass windows these durable lenses are built to last you even longer. The snorkel included in this package is a dry snorkel meaning you can completely submerge it underwater without getting any water in your breathing tube. This is great for those who like to swim deeper to explore caves or different areas. This makes it so that you will no longer run the risk of inhaling water and choking while you are vulnerable in the water. A hypoallergenic mouthpiece ensures that you don’t have a plastic taste in your mouth as you swim. This snorkel is incredibly flexible allowing you to conform it to the shape that works best for you. This package includes snorkel fins that are customizable to perfectly form fit your foot. With an open heel and adjustable straps these fins can conform not only to different sizes of foot but also to different widths. Dual composite blades allow you to cut through the water with ease propelling you further with less effort. This will reduce the amount of work you do and allow you to focus more on what you are seeing. This package is rounded off with a carrying bag that is perfect for keeping your gear together in your luggage and easily hauling to the beach. The mesh openings on this bag are ideal for allowing your gear to dry and provide ventilation to keep it smelling fresh. An adjustable padded shoulder strap makes carrying your gear a breeze. Featuring an extra zippered pouch in the front, you will be able to bring all your favorite accessories along with you. This snorkel set is made to travel with ease. From the mesh carrying bag, flexible snorkel, lightweight flippers to the compact mask you can easily bring your snorkeling gear with you just about anywhere in the world. The mask included may carry a two window design but the large lens allows you to have a panoramic view of the life buzzing underwater. Made with a tempered glass lens this mask is durable enough to last you many seasons to come. The dry top snorkel offers the protection you need from water entering your breathing tube. This allows you to go deeper into the ocean knowing that you are protected from choking on unexpected water. Made using a small and flexible mouthpiece, you do not have to worry about jaw fatigue. The open heeled design of the dive fins allows your feet to fit comfortably in the flippers without cramming your toes. This design fits more people and the adjustable strap sits comfortably giving you a custom feel. The short fin design is great for traveling while giving you a more powerful kick that will expertly cut through the water. The mesh carrying bag is the best for travel. The incredibly lightweight design will not weigh down your luggage while keeping all your gear together. Made with fast drying technology you can easily rinse your gear and allow it to air dry and avoid any odor. When buying a complete snorkel package it is important you know what features to look for in every item that is included. This will ensure you get the top of the line snorkel package. When looking for a high quality snorkel mask, it is great to get one with an anti-fog treatment. This will ensure you do not need to constantly be cleaning your mask. A tempered glass lens will ensure you have a durable lens that will be built to lens. A silicone skirt that form fits your face will ensure that you have a watertight seal while snorkeling. It is also important to note the range of view you will get from your mask. Typically a single lens design will offer the greatest range of view. Some offer a wide-view design in the shape of multiple windows on the side of your mask as well. For safety reasons, it is best to go for a snorkel with a dry top valve. This will ensure that your breathing tube stays free from water. This is an important feature for those who are not strong swimmers as well as those who enjoy diving below the surface. A simple splash guard is suitable for those who are swimming in choppy or busy water where splashing is a high possibility. When looking for dive fins, it is important to know your shoe size. Dive fins with an open heel and adjustable strap design will give you the most comfortable and form fitting feel. Opting for short fins, while not as powerful, are great for those who plan to travel with their gear as they will take up less room in your luggage. Q: How Do You Dive With A Snorkel Gear Package? A: Snorkeling along the surface of the water is great but when you get to deeper water you may want to dive to see things from a different perspective. After you have all your gear on and you’re in the water take a large breath and bend your body into an upside down “v” shape. Do this by stretching your arms in front of you and bend them down so they form a 90 degree angle. This will push your bum into the air and propel you towards the bottom. Remember to not take in any more air until your snorkel has been purged of water. This is done by breathing out or by pressing the one way valve most snorkels have. Q: How Do I Disinfect My Snorkel Gear? A: This can be done in many ways. Some dive shops have two drums of water, one with a bleach solution and the other being completely fresh water. You will dunk your gear into the bleach solution and then rinse it off in the freshwater. This will kill all the bacteria and salt water on your gear. If you’re looking to make your own solution add 1 part bleach to every 10 parts water. Q: How Much Do Snorkel Gear Packages Cost? A: This is a difficult question to answer because the price you pay has everything to do with the quality of gear you get. While it is possible to get cheap snorkeling gear, it is likely not to last you for very long. 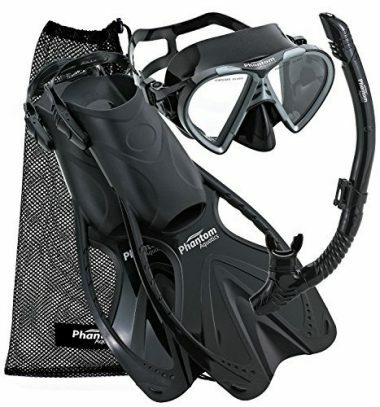 If you are on a budget opting for a snorkel gear package is a much more affordable way to go. These will cost between $60-$120 for everything you need to get into the water. If you are wanting to buy separately you can expect to get a mid range dry snorkel for around $40-$60. You will also have to buy a snorkel mask and fins separately. Q: How Do I Choose My Snorkel Set? A: When choosing the right gear for your next snorkel trip there are lots of things to consider. First off, it is important to understand the different items you will need for your trip: a snorkel, a mask, and fins. Knowing these items independently will help to ensure that each one you buy is of high quality. First, it is wise to decide whether you prefer a traditional snorkel style with a separate mask and snorkel, or would rather go with a full face mask. Like anything, there are pros and cons to each. A full face snorkel mask is not good for travel as it is quite bulky. Due to the amount of air in a full face mask they do not allow you to dive below the water’s surface either. They are however very easy to learn off and are great for beginners. If you decide to go the traditional route, choosing your snorkel is a very easy task. First, you will want to ensure you opt for a dry snorkel. This type of snorkel has a valve at the top that stops water from flowing inside when splashed or free diving. This is a very important safety feature. When looking for a quality snorkel mask you will want to consider if you are going to be using it for any deeper dives below the surface. If you think you may want to use your mask for scuba diving in the future, it is best to opt for a mask with tempered glass. When choosing your ideal snorkel fins you will want to make sure they are designed specifically for snorkeling. These shorter fins help you propel through the water with ease. Q: Can I Take My Snorkel Gear Package With Me On Vacation? A: This is a common question with an incredibly easy answer: Absolutely! If you are planning a tropical vacation to Hawaii bringing along your own snorkel set is a no brainer. There are plenty of things to explore while in their warm clear waters. When traveling on a plane with your gear, you will have to take extra precautions. Most importantly you will want to pack your gear in a safe way as to not break or ruin anything. Some snorkel packages come with a bag to safely store your gear in. Be sure to always lay your fins flat and protect your mask by wrapping some clothing around it. There are many beautiful snorkeling destinations around the world. Having your own gear with you will save you money and can make your holiday much more enjoyable. Q: How Should I Clean And Care For My Snorkel Gear? A: Your snorkel gear package isn’t cheap so it is important to take good care of it. Proper care and maintenance will help to increase the lifespan of your snorkel. Preparing your new mask is important. After your first trip out you will still have to maintain it with proper cleaning after every use. Cleaning your mask and snorkel are virtually the same being sure to rinse your gear after every use. Keeping out of direct sunlight be sure to always allow your gear to dry completely before storing. Buying a complete snorkel package rather than buying each item separately can save you a lot of time and energy. With the convenience of an all-in-one package, you will find everything you need to have an amazing vacation in the same place. Snorkel gear reviews agree that buying a packaged set will ensure that you get top quality compatible gear. Any of the top 10 snorkel sets on our list will help to ensure that your next vacation is unbelievable. What do you think about the packages that made this year’s list? Talk to us about it in the comment section below.